It’s time. I have had so many reservations about sharing our conversion story. My biggest hold up was (and honestly, still is), that I am still so new. Everyday I learn something about the Catholic Church that I had absolutely no idea about and feel like I should know, like last night I went to confession and saw a lit candle above the tabernacle and had to look up the significance (to show that Christ is present in the tabernacle). I was (still am!) afraid of misrepresenting something and even prideful and fearful of “messing up”. But, nope. No longer. I’m going for it, mess ups and all. Daniel and I both come from pretty different religious backgrounds. I was raised only with the basic knowledge that there is God. There is Jesus, God’s son. Jesus died. And we prayed every year on Thanksgiving and had never been inside of a church aside from my baptism until I was a pre-teen. 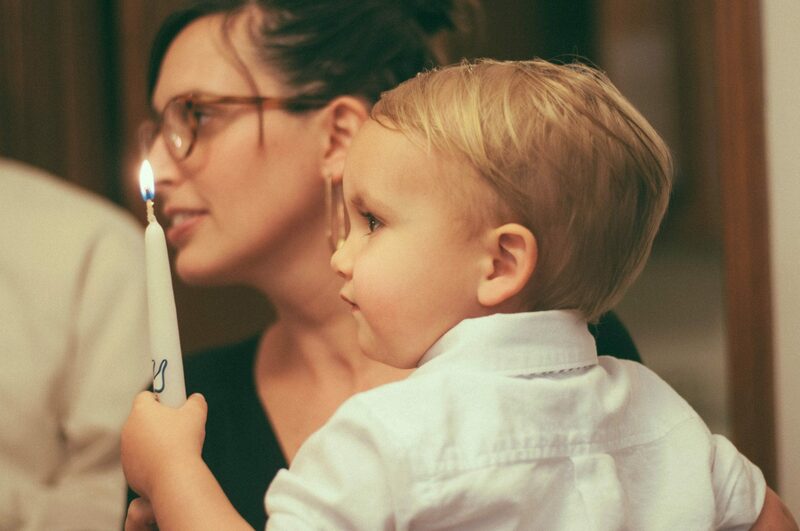 Daniel was raised attending a non-denominational church by parents who were raised Catholic, but left the church as adults. He went to a private Christian elementary school and transferred to a public middle school (where we met!). After friends of mine kept inviting me to go to youth group in 7th grade, I finally went and my world was opened up. Yes, I was going for social reasons but it still started laying the foundation for something bigger. I went to small group meetings (with my leader, Blythe!) and almost all of my friends were from church, but still going on Sunday wasn’t a thing. Now jump to newlywed, Jenna + Daniel. We moved to Pasadena and searched for a new church. We attended some non-denominationals out there, tried one in LA (where they had a straight up performance of a song, “Army of God” with camo dancers, stage lights, and we even got a gas gift card in mail to fund us driving back out there). Nothing felt right for us. We moved to Denver and tried to find a church out there, but again, nothing felt right. And then we moved to Ventura. Again, nothing. Ollie was still a baby and the places we tried were all pseudo baby friendly. It was either put your baby in the nursery or sit in the women’s bathroom and watch a TV screen of the sermon. 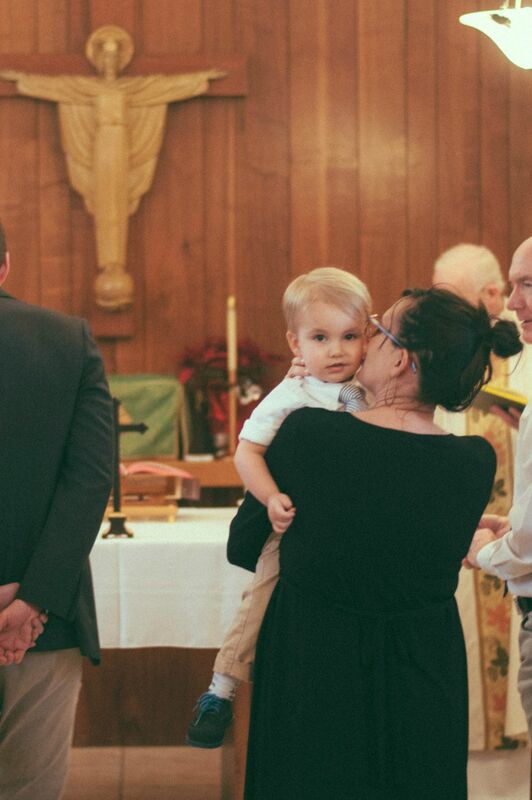 (Obviously we could be in with all the other churchgoers, but having the only child in there cooing and babbling with turning heads wasn’t that inviting). We were lost. We didn’t want to go to a church where it felt like you were walking into a rock concert and your baby needs protective headphones on. We wanted to find somewhere that we fit in. Where our children fit in. Where children were welcome through the entire church service and not segregated. Where hymns were sung. Where there was some order, not just finding a cool pastor and his interpretation of the Bible. We gave up for a while and just concluded that we would have to wait until Ollie was older where we wouldn’t feel so out of place. Let’s jump ahead again to last year. Specifically to March of last year. I’m nursing down 22 month old Ollie, 36 week old Atlas in my belly, and somehow I’m watching the inauguration of the new pope silently on my phone. I’m sitting there watching this with so much excitement. I’m not Catholic. I barely know anything about the Catholic Church, but somehow I’m laying in this bed tearing up watching Pope Francis’ speech, making the sign of the cross with all the faithful in the crowd. All the Catholics around the world. Daniel and I had talked about giving the ol’ Catholic Church a shot, but more as a last resort. Our two closest friends had converted to Catholicism, so there must be something going on over on the other side. (You can read Blythe’s amazing and way more thorough story here). After having Atlas, I had the pull that we needed to get our church situation figured out. We had kids to raise and we needed to figure this out while they were still so young. 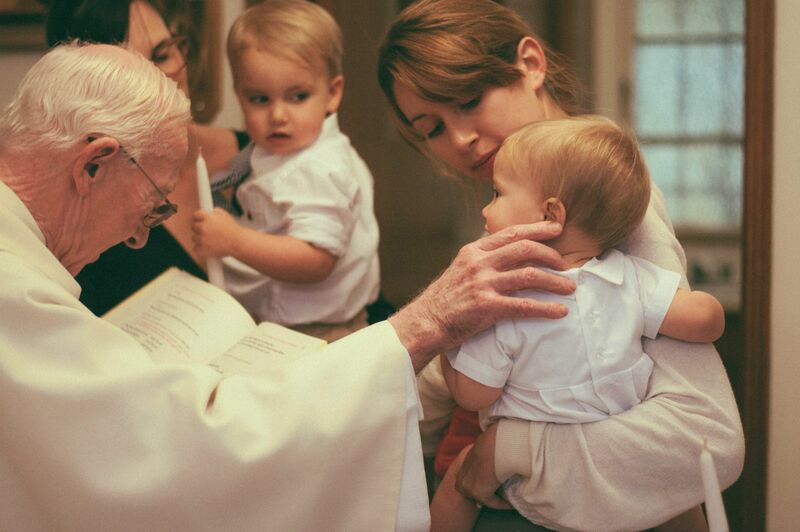 When Daniel and I were talking about what our options were, Daniel said, “Let’s just go to Mass.” It was that simple. Just go to Mass. After a couple weeks of excuses and chickening out, we finally went. I was so nervous! I have always had the longing to be Catholic on a very naive level in the back of my mind. I love traditions. I love rules. I love doing what’s right and going into Mass is intimidating! Everyone moves in unison. Everyone speaks in unison. 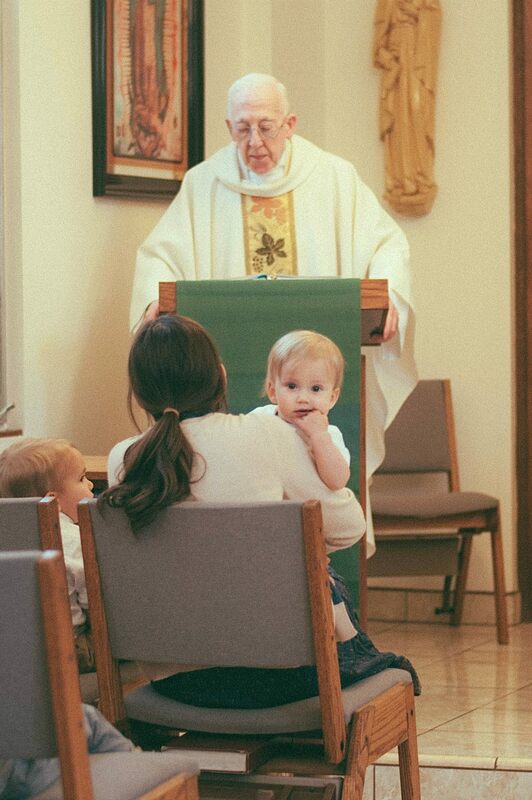 After we fumbled our way in the back pew through our first mass, it just felt so right. Babies everywhere. A larger authority where every Catholic around the world read the same passages. A beautiful choir sing psalms of praise! The environment and structure were exactly what we were looking for and couldn’t find at any of the protestant churches we checked out, so all that was holding us back was theology… which is kind of a huge deal. I knew very surface level things about Catholics. They believe in Mary and Saints? (what does that even mean!?). They don’t use birth control. They have a Pope. They cross themselves often, like before walking on a soccer field or before doing something scary and dangerous. They go to confession. Is there more? I didn’t know. We began to meet with a priest to talk about all things Catholic. It didn’t take long for us to pray and learn and realize we wanted to do this. We wanted to be Catholic. Everything that we thought were issues, very quickly became non-issues once we talked about them. Catholics pray to saints asking them to pray for them, just like all the Facebook status asking for everyone to pray for them to do well on their finals or for the health of a loved one. We already do that, so asking a saint, who is in heaven with God, to pray for you? Makes so much sense. Catholics don’t worship Mary, but is the most exalted of all Saints. Makes so much sense! Everything ended in the conclusion of THAT MAKES SO MUCH SENSE. This is the church that Jesus founded. The lineage of Popes can be traced from the Pope I watched take his seat early that year, back to to Saint Peter, the disciple, the first Pope. Even with the larger issues Daniel and I had with the Catholic Church, they were squashed by that truth. If we believe that the Catholic Church is the one, true church that Jesus founded, then it is our duty to accept its teachings. Also things like incorruptibles, or a saint’s collected blood turning back into liquid on certain days of the year, or the miraculous stories of Our Lady of Guadalupe, or Our Lady of Fatima, or the countless other insanely amazing things. We were a little nervous about letting people know we were becoming Catholic, especially Daniel’s family who were active members at their church. Funnily enough, when we were talking to them about it, we found out that they were going to meetings about rejoining the Catholic Church, which they are now back to! Perfection. At a private ceremony on January 24th, 2014, Daniel and I were accepted into the Catholic Church, our two boys were baptized, and we received our first communion. It is so crazy to think that this Saturday is Prim’s baptism. A year ago we had just started to attend Mass and had decided that this was the right path to take. This Catholic community has been so welcoming, so loving, so inspirational. I have never felt like I belong to a community more than I do now. 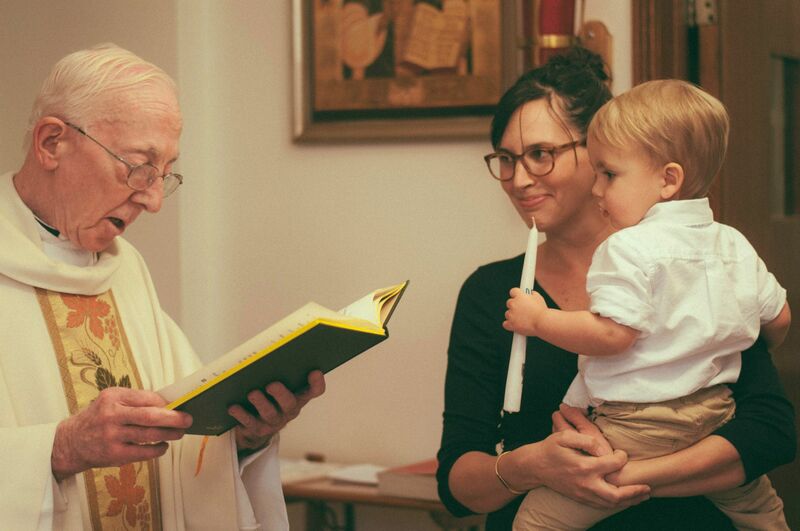 I have grown so much as a woman, a mother, a wife, and a Christian since becoming Catholic. 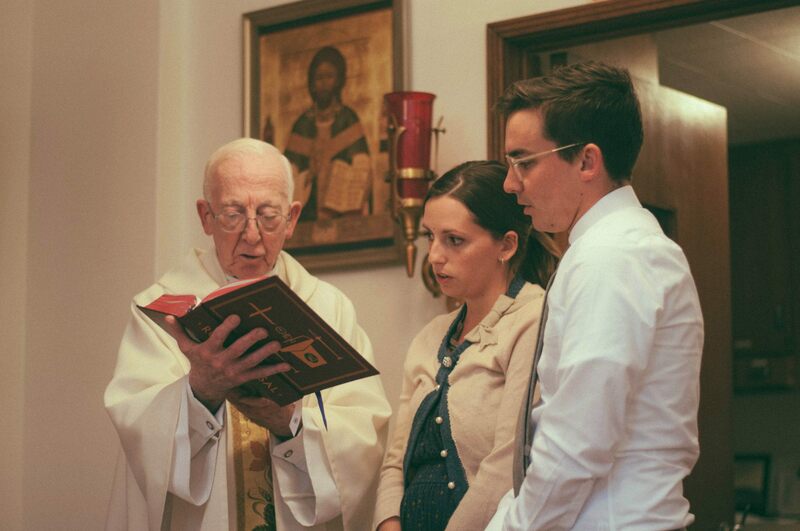 I am open to anyone who has any questions about the faith or more questions about our journey. 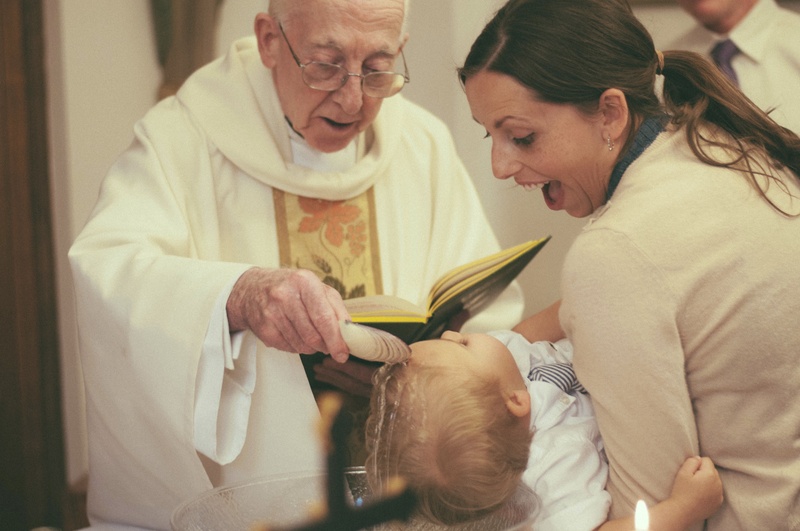 I still have so, so much to learn and a priest once told me that it’s not like you ever stop and know everything about the faith. You are constantly learning new things and it’s important to have that desire to keep learning and understanding and I don’t see that stopping anytime soon. I’m in a very tough dry spell faith wise. These conversion stories are just what I need! This is such a beautiful and inspiring story! And your whole little family coming into the Church the same day, such beautiful pictures! 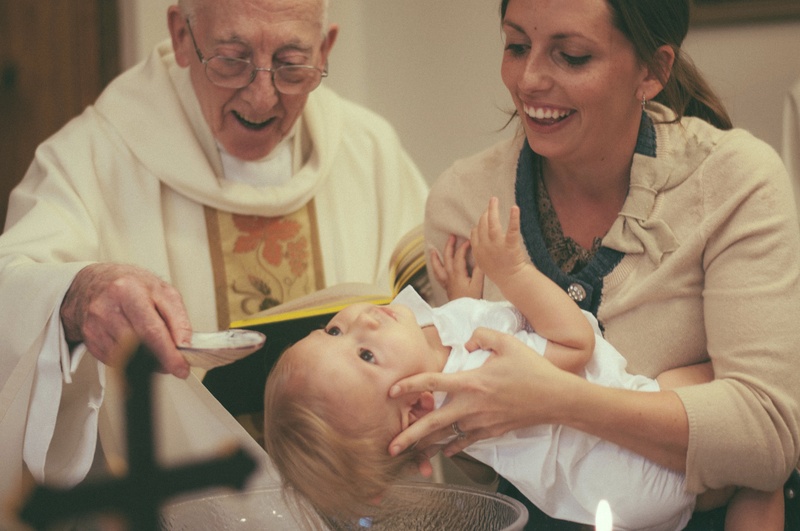 Blythe’s face says it all… We are so happy you are Home with us in the big ol universal Catholic Church! Such a sweet response, thank you so much! I love all the tradition of the Catholic church, the history and find myself constantly reading and following along, but with the nearest church an hour away and my ever increasing doubt about a god even being present (let alone an interventionist one) I just well.. I struggle. I totally feel you. I notice I feel the most distant from God and riddled with doubts when I am just that…not giving Him enough time and priority in my life and when things aren’t going the way I like. Something that has been life changing in my spiritual life is praying the morning offering. I often feel like I’m not getting what I need and this reminder in the morning helps get my mind in the right place of acknowledging that yes, I may suffer today, but I can either complain about it or accept it and offer it back up God and for those who are suffering worse than I. I mean, His intentions are so much more important than mine and it feels almost pathetic how often I need that reminder. Always a struggle! I just found your blog and wanted to thank you for sharing your conversion story! I was especially touched by the supernatural JOY on your friend/sponsor’s face as your family was received into the Church. 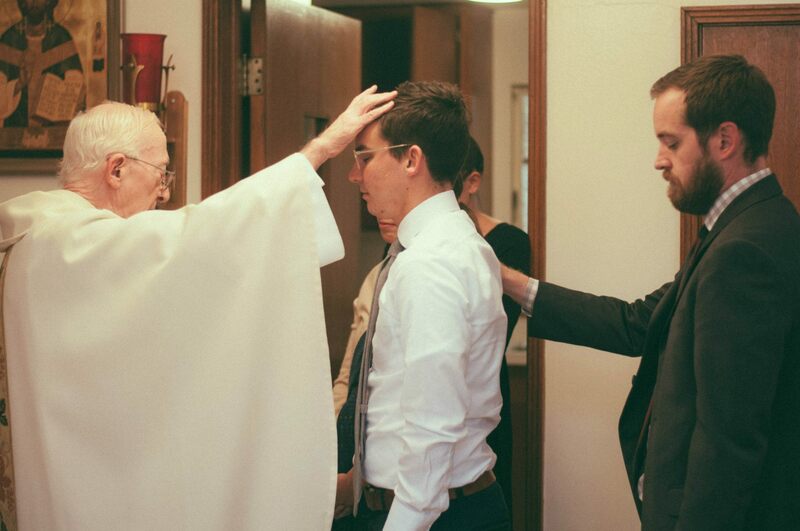 I am a cradle Catholic, but I LOVE reading these conversion stories because I know how much joy there is in living the Catholic life :) Welcome home and thank you for your courage in sharing your journey. Your story is so beautiful that it had me tearing up. I was born and raised Catholic, but it has really been in the last 5 years that I have grown the most in my understanding of and appreciation for our faith. Your sentiments of being worried about saying the wrong thing or not knowing enough about our the Catholic faith are feelings that I have ALL THE TIME, and I had pretty thorough catechesis growing up! Again, thank you! Beautiful, beautiful story. My husband and I were received into the Church ( similar backgrounds as your family too-down to re-vert parents!) on Easter Vigil 2014. Can relate to all your sentiments- thank you for sharing! Aww, thank you! And so crazy about the family revert being part of your story, too! Thank you for sharing this! I converted to Catholicism 9 years ago, before marrying my now husband. I’m embarrassed to say I doubt my decision but I think it has to do with not understanding a lot of the rituals. I went through RCIA but it was mostly about God, not about Catholic practices. Are there any resources you can recommend to help me understand the church better? Sometimes it all feels so impersonal and like everyone is just thoughtlessly reciting what they know, but again, I think this is just due to my misunderstanding. Thank you for any help you may offer! Hi Natalie! I felt that same way for a while until I started connecting with other Catholic women in my community and online. There are so many blogs that offer that kind of insight— http://www.catholicallyear.com, http://www.aknottedlife.com, http://www.catholicnewsagency.com/mamaneedscoffee/, http://www.carrotsformichaelmas.com. I find myself not understanding things all the time and am constantly having to research and read and learn more about the faith. It’s so rich and beautiful, but it does feel overwhelming at times but putting in the effort to seek answers and deepen the faith really enriches it. I hope that helps and thank you for reaching out! Thank you so much for directing me to your story. I am always in awe of the movements of the Holy Spirit in others’ lives. I found you through Instagram and love getting to see the little glimpses into your daily life there. And I’m going to try Outlander tonight! Thanks for the rec!